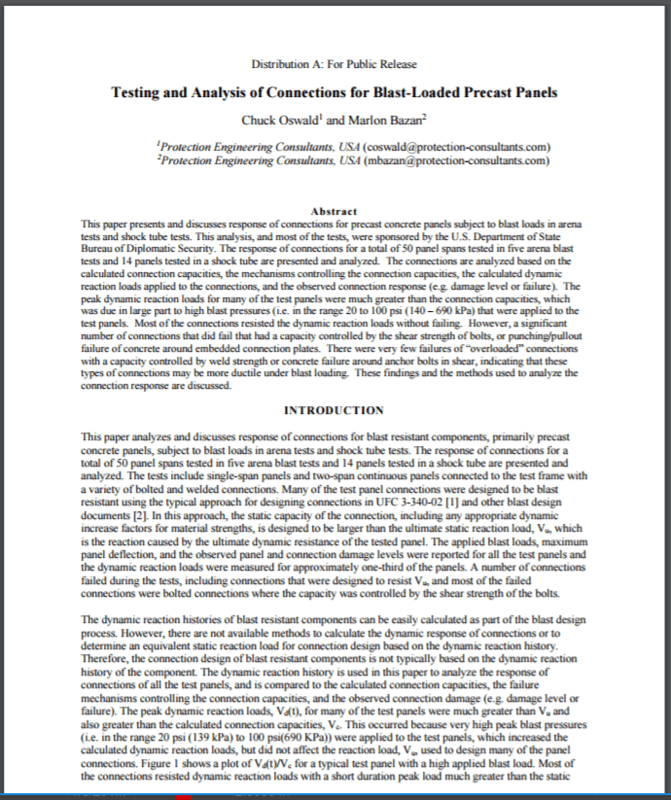 This paper presents and discusses response of connections for precast concrete panels subject to blast loads in arena tests and shock tube tests. This analysis, and most of the tests, were sponsored by the U.S. Department of State Bureau of Diplomatic Security. The response of connections for a total of 50 panel spans tested in five arena blast tests and 14 panels tested in a shock tube are presented and analyzed. The connections are analyzed based on the calculated connection capacities, the mechanisms controlling the connection capacities, the calculated dynamic reaction loads applied to the connections, and the observed connection response (e.g. damage level or failure). The peak dynamic reaction loads for many of the test panels were much greater than the connection capacities, which was due in large part to high blast pressures (i.e. in the range 20 to 100 psi (140 – 690 kPa) that were applied to the test panels. Most of the connections resisted the dynamic reaction loads without failing. However, a significant number of connections that did fail that had a capacity controlled by the shear strength of bolts, or punching/pullout failure of concrete around embedded connection plates. There were very few failures of “overloaded” connections with a capacity controlled by weld strength or concrete failure around anchor bolts in shear, indicating that these types of connections may be more ductile under blast loading. These findings and the methods used to analyze the connection response are discussed. Read the full PEC Publication by Dr. Charles Oswald, P.E. and Dr. Marlon Bazan, P.E.